Technical Sequence for Battery Ensemble. GO! Clocking in at nearly 16 minutes in length, this sequence represents a complete warm-up package for the battery ensemble. It was designed by Murray Gusseck, battery caption manager for the Santa Clara Vanguard, to be a self-contained warm-up that very specifically targets the various muscle groups of the fingers, wrists, and forearms in an equally specific order of events. With over 20 individual exercises in 9 different categories, this mammoth practice tool contains something for just about everyone. What's more is that the entire sequence is played at one tempo—90bpm! Of course, because of this unique tempo condition, you can completely re-arrange the individual exercises according to preference. Additionally, each part can be broken out from the sequence and worked separately according to your particular circumstances, or you can run the full sequence by simply turning the metronome on and starting from the top! For instructors and students of varying experience levels, GO! represents a unique tool for challenging the hands AND the mind. From "8 on a hand" style exercises to simple Moeller push-pull techniques, it's all there for you. This product contains more than just the sheet music for the sequence. 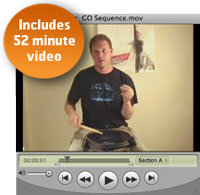 You will also find a tutorial Quicktime movie (almost 1 hour in length, with chapter markings!) where Murray himself demonstrates and helps explain the techniques used for each section. There are also four Virtual Drumline MP3 recordings—the first being a full battery simulation at the target tempo of 90bpm, and the other three being "play-along" snare tracks at 3 different tempos (slow, medium, and fast). Lastly, a detailed README file is included that lists performance notes broken down by section.